Muhammad Ali (born Cassius Marcellus Clay, Jr., January 17, 1942, died June 3, 2016) was an American professional boxer, philanthropist, and social activist. Considered a cultural icon, Ali has both been idolized and vilified. Originally known as Cassius Clay, at the age of 22 he won the world heavyweight championship from Sonny Liston. Ali changed his name after joining the Nation of Islam in 1964, subsequently converting to Sunni Islam in 1975. In 1967, three years after Ali had won the heavyweight championship, he was publicly vilified for his refusal to be conscripted into the U.S. military, based on his religious beliefs and his opposition to the Vietnam War. Ali was eventually arrested, and he was found guilty on draft evasion charges. He was stripped of his boxing title, and his boxing license was suspended. He was not imprisoned, but he did not fight again for nearly four years, while his appeal worked its way up to the U.S. Supreme Court, where it was eventually successful. Ali would go on to become the first and only three-time lineal World Heavyweight Champion. Nicknamed “The Greatest”, Ali was involved in several historic boxing matches. Notable among these were three fights with rival Joe Frazier, which are considered among the greatest in boxing history, and one with George Foreman, where he finally regained his stripped titles seven years later. Ali was well known for his unorthodox fighting style, epitomized by his catchphrase “float like a butterfly, sting like a bee”, and his employment of techniques such as the “Ali Shuffle” and the “rope-a-dope.” Ali brought beauty and grace to the most uncompromising of sports, and through his wonderful excesses of skill and character, he became the most famous athlete in the world. He was also known for his pre-match hype, where he would “trash talk” opponents, often using rhymes. 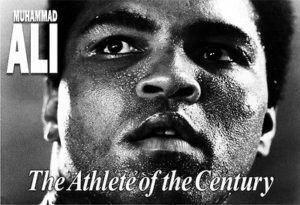 In 1999, Ali was crowned “Sportsman of the Century” by Sports Illustrated, and “Sports Personality of the Century” by the BBC. Cassius Marcellus Clay, Jr., was born on January 17, 1942, in Louisville, Kentucky. The older of two boys, he was named after his father, Cassius Marcellus Clay, Sr., who was named after the 19th century abolitionist and politician of the same name. 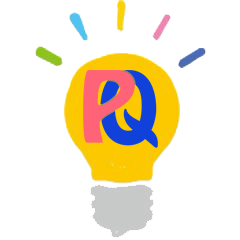 His father painted billboards and signs, and his mother, Odessa O’Grady Clay, was a household domestic. Although Cassius Sr. was a Methodist, he allowed Odessa to bring up both Cassius and his younger brother Rudolph “Rudy” Clay (later renamed Rahman Ali) as Baptists. He is a descendant of pre-Civil War era American slaves in the American South, and he is predominantly of African-American descent, with some Irish and English ancestry. Clay was first directed toward boxing by Louisville police officer and boxing coach Joe E. Martin, who encountered the 12-year-old fuming over a thief who took his bicycle. He told the officer that he was going to “whup” the thief. The officer told him that he’d better learn how to box first. For the last four years of Clay’s amateur career, he was trained by legendary boxing cutman Chuck Bodak. Clay won six Kentucky Golden Gloves titles, two national Golden Gloves titles, an Amateur Athletic Union National Title, and the Light Heavyweight gold medal in the 1960 Summer Olympics in Rome. Clay’s amateur record was 100 wins, with five losses. Shortly after his return home from Rome following the Olympics, Ali would claim in his 1975 autobiography that he threw his medal into the Ohio River after he and a friend of his were being refused service at a “whites-only” restaurant, and having been in a fight with a white gang. However, two years later in the 1977 biopic, The Greatest, a film scene depicting the medal-throwing incident only has Ali being forced out of the diner due to his race, then quickly cutting to the scene where Clay threw the medal into the river in disgust. Ali brought up the latter story of events in later years in a number of interviews. Both stories have been heavily debated, and several of Ali’s friends, such as photographer Howard Bingham and Bundini Brown, disputed this story, calling it false, with Brown later telling Sports Illustrated writer Mark Kram, ” Honkies sure bought into that one!” It was stated that Ali kept his medal until “the gold rubbed off.” This incident is not mentioned in Thomas Hauser’s own official biography of Ali, who confirmed that Ali was refused service at the diner, but said that he lost his medal a year after he won it. Ali later received a replacement medal at a basketball intermission during the 1996 Olympics in Atlanta, where he lit the torch to start the games. Clay made his professional debut on October 29, 1960, winning a six-round decision over Tunney Hunsaker. From then until 1963, Clay amassed a record of 19-0, with 15 wins by knockout. He defeated boxers such as Tony Esperti, Jim Robinson, Donnie Fleeman, Alonzo Johnson, George Logan, Willi Besmanoff, Lamar Clark, Doug Jones and Henry Cooper. Clay was knocked down twice during this early run, by Sonny Banks and Henry Cooper. The Cooper fight was stopped due to deep cuts in Cooper’s eyes in the fifth round. Clay also beat his former trainer, veteran boxer Archie Moore, in a 1962 match. After Clay left Moore’s camp in 1960, partially due to Clay’s refusal to do chores such as dishwashing and sweeping, he hired Angelo Dundee to be his trainer. He had met Dundee in February 1957 during Ali’s amateur career. Around this time, Clay also sought longtime idol Sugar Ray Robinson to be his manager, but he was rebuffed. A disputed ten-round decision over Doug Jones was later named “Fight of the Year” in 1963. Ali had amassed a record of 19–0, with 15 knockouts, and he became the top contender for Sonny Liston’s title. The fight was set for February 25, 1964 in Miami. Despite his strong record, Ali was still a 7-1 underdog. During the weigh-in on the day before the bout, the ever-boastful Clay, who frequently taunted Liston during the buildup by dubbing him “the big ugly bear” (among other things), declared that he would “float like a butterfly and sting like a bee,” and, summarizing his strategy for avoiding Liston’s assaults, Ali said, “Your hands can’t hit what your eyes can’t see.” At the pre-fight weigh-in, Clay’s pulse rate was around 120, more than double his norm of 54. Liston, among others, thought this stemmed from nervousness. Clay and Liston fought for six rounds in their first title fight, with Clay dominating most of the rounds, except in round four, when it was alleged that Clay had trouble seeing due to a substance in his eyes. Though not confirmed that this happened to Clay, Bert Sugar claimed that at least two of Liston’s opponents complained about their eyes ‘burning’, suggesting a possibility that Liston’s corner was deliberately attempting to cheat. Despite Liston’s attempts to knock Clay out in the fifth, Clay was able to escape Liston’s offense, until sweat and tears rinsed the substance from his eyes, leading to Clay’s being able to respond back with a flurry of combinations near the end of the fifth round. During the sixth round, Clay dominated Liston throughout. When Liston refused to answer the bell for the seventh round, Clay was declared the winner. Liston would later claim that he had injured his shoulder. Following the win, a triumphant Clay rushed to the press stands, pointing to them and screaming, “I fooled you!” During the now-infamous in-ring interview following the match, Clay shouted, “I shook up the world!,” and, “I must be ‘The Greatest’!” When Clay won, he became the youngest boxer to take the title from a reigning heavyweight champion, at just 22 years of age. Though Floyd Patterson was the youngest to win the heavyweight championship at 21, it was during an elimination bout following Rocky Marciano’s retirement. Mike Tyson later broke the records for both Clay and Patterson, in 1986 at 20 years old, during his fight with Trevor Berbick. Clay, now having changed his name to Muhammad Ali following his conversion to Islam, met up with Liston for their rematch in May the following year. Midway through the first round, Liston was knocked down by one of Ali’s punches, later dubbed by the press as the “phantom punch.” Referee Jersey Joe Walcott stopped the match shortly afterwards, and Ali was declared the winner around 1:52 of the first round. Rumors speculated that Liston dropped to the ground purposely, due to threats from NOI extremists, or that he “threw” the fight to pay off debts, simply waiting to be counted out. Ali’s second title defense was against Floyd Patterson. The bout was alleged to have been so brutal, due to Patterson’s refusal to call Ali by his Muslim name. Throughout the fight, Ali taunted Patterson by shouting, “What’s my name?” to him. It’s alleged that Patterson may have strained his sacroiliac, which made it difficult for him to escape Ali’s punches. Ali and then-WBA heavyweight champion boxer Ernie Terrell had agreed to meet for a bout in Chicago on March 29, 1966, but the Illinois Athletic Commission refused to host the fight, due to Ali’s Vietnam War statements. Following these bouts, Ali traveled overseas and won championship bouts against George Chuvalo, Henry Cooper, Brian London and Karl Mildenberger. Ali’s next fight, after his return to the United States, was against Cleveland Williams, in the Houston Astrodome. According to Sports Illustrated, the bout drew a then-indoor world record of 35,460 spectators. Ali ended up beating Williams in three rounds. Williams was recovering from being shot, at point-blank range, by a Texas policeman, a year and a half before. He entered the fight missing one kidney and 10 feet (3.0 m) of his small intestine, and with a shriveled left leg caused by nerve damage from the bullet that was still lodged in his body. Ali and Terrell finally met in Houston to face off on February 6, 1967. Like Patterson before, Terrell would defy Ali’s order to call him by his Muslim name. As a result, Ali aggressively attempted to humiliate Terrell, shouting, “What’s my name, Uncle Tom, what’s my name?” Terrell later alleged that Ali had rubbed his thumbs on Terrell’s eyes, causing problems. Critics described the fight as “one of the ugliest boxing fights.” Tex Maule later wrote: “It was a wonderful demonstration of boxing skill, and a barbarous display of cruelty.” Despite this, Ali denied that he intended to harm Terrell on purpose, nor did he feel that he was cruel to Terrell during the bout. His final title defense would be against Zora Folley, a month later. Following this, Ali’s title would be stripped, after his refusal to be drafted to Army service. This resulted in his boxing license being suspended, and he was later sentenced to five years for draft evasion. With his case still in appeal, Ali returned to the ring after winning a boxing license in Atlanta on August 12, 1970, thanks to State Senator Leroy R. Johnson, where he was granted a license to box by the City of Atlanta Athletic Commission. Ali’s first return bout was against Jerry Quarry on October 26, resulting in a win after three rounds. Following this match, the New York State Boxing Commission reinstated Ali’s license to fight ther, and Ali fought against Oscar Bonavena at Madison Square Garden in December 1970, winning with a TKO during the 15th round, leaving him as the top contender against then-heavyweight champion Joe Frazier. 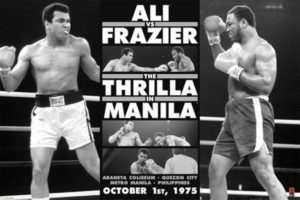 Ali and Frazier’s first fight, held at the Garden on March 8, 1971, was nicknamed the “Fight of the Century,” due to the hyped antics during their pre-fight publicity. After being knocked down during the 15th round, Ali eventually suffered his first professional boxing loss in this fight. The boxer then returned to the ring with bouts against Quarry, a second bout with Floyd Patterson, then Bob Foster in 1972, winning a total of six fights that year. In 1973, Ali suffered another loss at the hands of Ken Norton, who broke Ali’s jaw during the fight, though it’s contested which round he broke it in, with Angelo Dundee later claiming that it was broken in the second round. 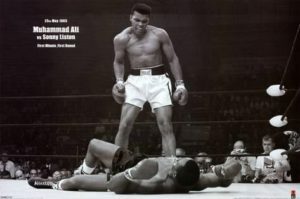 Others, including Norton, stated that Ali broke it much later in the fight. After initially seeking retirement, Ali won against Norton in their second bout, leading to his second fight with Frazier, this time with Ali winning, on points, in their January 12, 1974 rematch. 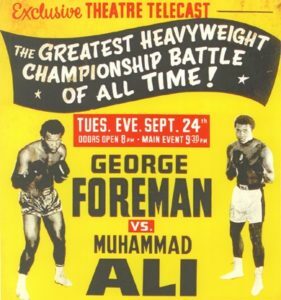 Ali faced off against heavyweight boxing champion George Foreman in Kinshasa, on October 30, 1974, in a bout nicknamed “The Rumble in the Jungle.” Almost no one, even Ali’s long-time supporter Howard Cosell, gave the former champion a chance of winning. Analysts pointed out that Joe Frazier and Ken Norton had given Ali four tough battles in the ring, and Ali had won two of them, while Foreman had knocked out both Frazier and Norton in the second round of each of their fights. During the fight, beginning in the second round, Ali retreated to the ropes, inviting Foreman to hit him while counter-punching and verbally taunting the younger man. Ali leaned on the ropes and covered up as Foreman threw punches that were deflected, and that didn’t land squarely. Midway through, when Foreman began tiring, Ali countered with punches and flurries. This practice would later become known as the “Rope-A-Dope” technique. In the eighth, Ali dropped Foreman with a combination at center ring, and Foreman failed to make the count. Against all the odds, Ali had regained the title.